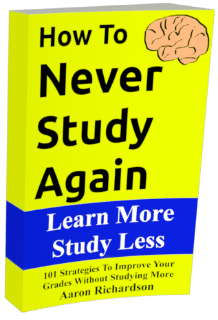 This is Kay and I just wanted to introduce a post we got from Ryan Craig (the Author of A New U: Faster + Cheaper Alternatives to College.) Aaron personally read through an ebook copy of the book and was like: “Did I write this myself and get a good editor or something?” The point: if you like Smart Student Secrets then we highly recommend the book. While we admire her ambition and positive perspective, she would benefit from greater awareness of our current system of higher education. With over $1.5T in student debt and terrifying growth rates (828% since 1999), the student debt crisis isn’t an unfamiliar topic for the US, particularly for high school students and their families. Despite this crisis, universities continue to increase tuition, causing an additional $50B in student debt each year. The 12 million student loan borrowers in their thirties still owe an average of $34,000. Unfortunately, the enthusiastic student in the coffee shop was wrong; college graduates are not figuring out how to pay off their student debt. And if they are, it is taking them a lot longer than they expected. What’s even harder to swallow is how current employment outcomes are failing to match the ever steeper tuition. Roughly one third of 2009 college graduates were still living with their parents 18 months after graduation and only 17% were making more than $40,000. More recent data shows that 86% of the class of 2015 graduated with no job offers. Despite such disheartening employment outcomes, employers have expressed immense trouble with potential hires. According to the Society of Human Resources Management, the time to fill a job opening is 42 days. The job market is evolving, and universities have been unresponsive to the needs of students and employers. Given these forces at play, it is not surprising that bachelor’s degree programs seem to losing popularity. College enrollment fell 12% between 2015 and 2016 with only 34% of institutions meeting enrollment targets last fall. Parents and students are finally saying ‘enough’ and are starting to opt in to Faster + Cheaper routes into the workforce. Common examples of faster + cheaper alternatives include bootcamps, apprenticeships, and staffing programs with embedded Last-Mile Training: providing students with the digital skills, soft skills, and industry knowledge that traditional colleges and universities generally overlook. Bootcamps provide Last-Mile Training for a particular job or job family (e.g., web development). Apprenticeships are on-the-job training opportunities that often encompass some form of formal education. Staffing programs with embedded Last-Mile Training offer both formal education and on-the-job training with employer partners for a set period. Who should consider Faster + Cheaper Alternatives to College? 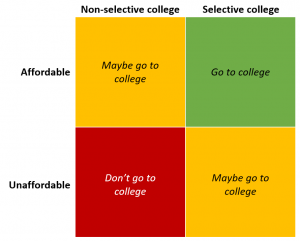 If you’re thinking of broadening your college decision from “where should I go to college?” to “whether I should go to college,” we propose a simple framework. Selectivity is an important metric to consider as selective universities have always provided a valuable signal in the labor market. Selective universities lead critical research, attract some of the most motivated students, and have strong alumni networks that can be invaluable well into the future. Nonselective universities are less valuable in these regards. We recommend using a 50% acceptance rate as the threshold between selective and non-selective. Defining affordability is more challenging as it can and should depend on a family’s savings, current income level, and eligibility for scholarships and financial aid. The Lumina Foundation has developed “The Rule of 10” which can help students and families navigate what is affordable and what truly is not. What is the school’s graduation rate? And if applicable, what is the graduation rate for first generation college students? What is the average salary of graduates? What are earnings five or ten years after graduation? What profession are you considering? Is a formal education or license needed (e.g. lawyers, doctors)? For the expected degree, how well does the college prepare students for the workforce or does more relevant training exist? Do you have a strong network of family and friends to support you through college? Students who opt out of college have another challenging decision to make: which Faster + Cheaper alternative is best? While the new book, A New U: Faster + Cheaper Alternatives to College provides a directory of nearly 300 programs leading directly to good first jobs in technology and other growing sectors (the very jobs college graduates are having an increasingly hard time landing), we have outlined our ten favorites below. None of these programs require a college degree and all are strong and viable alternatives that have the potential to provide graduates with a relevant and meaningful pathway into the job market. Techtonic provides an apprenticeship in software development that requires no upfront tuition. Students are hired as Techtonic employees from day 1 and gain real experience working for Techtonic clients through an apprenticeship model. Upon completion of the apprenticeship, students receive 39 college credits and continue on as a Techtonic developer until they’re hired full-time by clients, which is encouraged by Techtonic. This program is based in Boulder, CO, but is expanding to other cities. Similar to Techtonic, FastTrack’d also does not require any upfront tuition and offers a 9-week bootcamp focusing on Java and .net software development. Based in Nashville, FastTrack’d provides housing during the training, does not require prior experience, and has demonstrated strong outcomes with 90% graduation and 85% conversion to clients. On the longer-side, Holberton offers a 2-year software engineering program which includes 9 months of initial training, a 6-month internship, and 9 months of specialized training on a focus area of choice. Located in San Francisco, CA and New Haven, CT, Holberton is one of the more selective programs with only 150 graduates to date. They use Income Share Agreements to avoid tuition, requiring 17% of a graduate’s salary for 3 years if earning above $40,000. Located in Austin, Boulder, Denver, Los Angeles, New York City, Phoenix, San Francisco, and Seattle, Galvanize offers both software engineering (12 weeks at $18,000) and data science (13 weeks at $16,000). They have strong placement outcomes with 84% placement within 6 months at an average starting salary of $70,000. Acceptance rate is 20% and classes are hosted onsite at Galvanize co-working spaces so students can meet founders and employers on a daily basis. Galvanize also offers offsite optional prep, scholarships, and benefits for veterans. Distinct from software development and coding bootcamps, AlwaysHired provides Last-Mile Training for Sales Development Representatives (SDRs). Graduates earn on average $84,000 per year (base + commission) and are only required to pay $200 upfront; the rest of the training costs are covered by employers once hired. Class schedules are flexible with both in-person and online options, as well as full-time and part-time schedules. AlwaysHired has a 90% placement rate with most of their graduates finding jobs within 5 weeks. Always Hired is based in San Francisco. The largest coding bootcamp, General Assembly now does a lot more than just coding, with a range of both part-time and full-time programs in data science, web development, UX, digital marketing, iOS and Android app development. GA has recently launched an ISA option. Job placement is high at 88% within 6 months at a median salary of $65,000 and a 92% graduation rate. Software engineering and data science are the two programs offered by The Flatiron School with both online and in-person options (Atlanta, Brooklyn, Chicago, Denver, Houston, London, Manhattan NYC, Seattle, and Washington DC). Flatiron is now owned by co-working space leader WeWork. Courses are 15 weeks full time and allow students the option to either pay tuition upfront ($17,000) or with monthly payments (~$380 per month for 3 years + a $3,000 deposit). Flatiron claims a high job placement rate at 99% for in-person training and 94% placement for online. Flatiron also offers a few initial courses online for free to allow students the opportunity to test the waters before they commit. Offered both in Atlanta and Houston, DigitalCrafts has full-time (16 weeks at $13,950) and part-time (26 weeks at $9,500) courses in Full Stack Engineering. DigitalCrafts has smaller cohorts than the national average at 24 students and offers five students per cohort the option to participate in an ISA. Scholarships are automatic for women and veterans at $1,500 for full-time programs and $1,000 for the part-time program with the aim of making tech careers more accessible. Within 180 days, 91% of Atlanta and 86% of Houston graduates are placed within a job. Viewed as one of the more competitive college alternatives, App Academy has a 5% acceptance rate for its full-time 12-week software development program. Offered in New York City and San Francisco, the median salary for graduates is $105,000 and 95% are placed within a year of graduation. At $17,000 tuition, App Academy offers students three payment options: pay upfront in full, pay roughly half upfront and the other half after job placement, or defer all payments until after job placement. With only online courses, DesignLab’s UX and UI Design program is offered at a low tuition of $5,999 with the option to pay in low monthly installments. DesignLab’s full-time program extends 15 weeks and the part-time program lasts 28 weeks. While a basic understanding of visual design principles is required, the program’s pre-course (Design 101) gets all admitted students up to speed. DesignLab’s hallmark is mentorship, as the program equips all students with an experienced, employed mentor for not only the duration of the program (with 1-2 x meetings per week), but until students land a job in the field. On Corinne’s way out of the coffee shop, she stopped by the student’s table to wish her luck and suggested that she further think about the long-term implications of an expensive and nonselective college (although we left out the nonselective part). Hopefully she and others like her find articles like this helpful in approaching the college decision. Corinne Spears is an associate at University Ventures focusing on opportunities within healthcare and education to employment pathways. magnificent publish, very informative. I’m wondering whythe opposite specialists of this sector don’t understand this.You must proceed your writing. I’m sure, you have a huge readers’ base already!